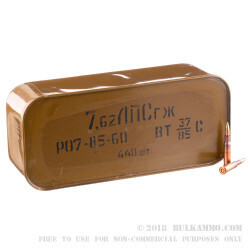 This 440-round spam can of 7.62x54r ammo is a special opportunity to save big time on some Russian military surplus ammo for your Mosin-Nagant. This Russian-made ammo features copper-washed steel casings, Berdan primers, and a magnetic 148gr full metal jacket bi-metal projectile. The best qualities of this ammo are the sealed case mouth and primer pocket, the awesome spam can, and the fact this ammo was produced to military specifications specifically for Russian fighting forces. The way this ammo is packaged enables it to be stored for an extended period of time. This ammunition is corrosive, so keep in mind that extended use of this 7.62x54r ammo will require extra cleaning of your firearm, but the low cost of this 440-round count can more than makes up for that extra labor at the end of the day. Don't miss out on this opportunity to stock up on 7.62x54r Russian Military Surplus ammo. Order your 440-round spam can today! Some act like you fire one round and your gun will rust away! First off, let's face it: this is all old ammo and the quality control that went into it isn't exactly all that great to begin with. QUALITY: Fair, at best. OAL varies wildly from just UNDER 3.000 to just OVER 3.040. Max OAL is 3.037. Some rounds will jump to the rifling while others are already in contact. Powder loads vary wildly as well. I've had some that gave almost no recoil while others kicked like a mule and split the neck of the cartridge. ACCURACY: Good, usually. If you're willing to take the time to measure each one and group rounds by OAL and weight, then you can get almost match grade performance. Straight out of the pack though, you're going to sling lead all over the target. RELIABILITY: EXCELLENT. I've yet to have a single mis-fire. Each round has gone off as expected. VALUE: EXCELLENT. I defy anyone to find this amount of ammo for the 7.62x54R chambered rifles for this same amount ($124). very good bargsin, and fun! The can is a fun conversation piece. It all arrived quickly, the phone service is great. Haven't had a dud, anf its been a lot of fun teaching lessons in kinetic energy to my nephews with water filled milk jugs. awesome stuff! this is why shooting com-bloc weapons are so much fun! cheap ammo and fireballs out of M44 mosins! Shoots fine, if it shoots. The ammo arrived very quickly and the case is indestructible. You need a special can opener or screwdriver to open. My friend let me borrow the special can opener and it took less than 5 minutes to open. The ammo was packed very tightly and secure. The rounds look impressive ! There were no surprises. The ammo was exactly as advertised and as expected. So far, no duds, no jams. Delivery was on time. Price was in range however I have seen it a few buck cheaper but not much and most of the time the ammo is unavailable at that lower price. Overall - Yes, I would buy it again. Great service. Reasonable s&h. Great shooting ammo. Corrosive primer, so clean immediately after shooting. Thanks for the opener. A must buy. I am absolutely blown away by the speed of shipping. Took just 23 hours from the time I placed my order to it arriving on my doorstep. Kudos to BulkAmmo and FedEx. Now the price for the ammo is still higher than I would like for 54R. But lower than what anyone else is charging and no other company's customer service and shipping speed compares. Return and referral earned from this guy. I have ordered from you a few times and I am very well pleased with the quality and service of your product.. It arrived in two days,no damage,product was far superior than any other site I,ve ordered from in the past.I will continue to purchase from you....in the future. I purchased this ammunition for its value mainly, 440 rounds of high quality ammo for the price I got was a steal. This ammo, when fired, felt like it had significantly more force in the recoil than the surplus ammunition I bought with my Mosin, but this was trivial. It didn't feel like it had much more muzzle climb though. With this ammo I was consistently, as was possible, hitting in a tight grouping close to the center of mass on the target. This at 38 meters, free standing using iron sights. I haven't bought any in a while, but I will after the holidays when I have a bit more to spare. I have bought several of these cans, never had a bad round, shot great from my M91/30, my M44 (my buddy has the same pair worked in his) and the brother-in-laws M38. 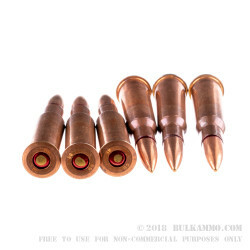 54R is second only to 22LR in ammo I shot the most volume of (7.62x39 is a contender in that area too), and I have been shooting for almost 30 years, I love the spam can ammo, best plinking stuff out there, shoots straight, no feed jams, no ejection issues (had problems with some cheapo eastern Europe stuff, but NEVER with my Russian spam cans) NEVER any of those partially burst shell casings, they just work as intended. Anyone who removes a star for being corrosive should be smacked, as ALL spam can ammo is, you should know that going into it, it is not a negative, it is simply how it is. Ammo shoots just fine. Corrosive so you must clean afterwards. Mine also came with the can opener. Came with a can opener! 7.62x54r Great ammo! I will buy more. Ordering was easy, ammo arrived on time and in great condition AND included the can opener which I didn't expect. Ordered on Sunday night. At the range Wednesday night. This ammo was reliable and a great deal. My only disappointment is not receiving the special can-opener. I hard a difficult time opening the tin box that could have been avoided. Bought 880 rounds of this stuff. I have shot 200 already with not one misfire. Only thing to remember is when you get home clean the barrel and bolt with Windex (ammonia) then run patches through with Ballistol until clean.. I also clean the bolt thoroughly.. You can use other methods as well. Takes me about a 1/2 hour. This stuff shoots perfect. AGAIN clean your Mosin/Nagant after firing this stuff.. ammo is corrosive..
Q: Is this steel core? A: The core is lead, but the plating on the bullet will attract a magnet. It has a thin layer of steel over the lead core. Most ranges will not allow this if they ban the use of magnetic ammo. Q: How is ammo shipped? Does it come directly to my home, or does it have to do to an ffl? Thank you, Don. A: Hello Don, You can place an order over the phone or online and we can ship it right to your door, with the exception of New York State in which we have to ship to an FFL. 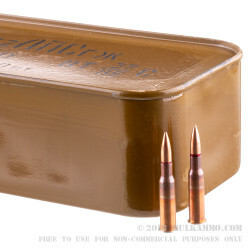 We ship ammo using FedEx or UPS ground in the factory boxes. If you would like a more discreet shipping box, just select the Overbox option during checkout and it will ship in a plain brown box with the required ORM-D markings. Q: does this round of ammo fit 8mm Mauser? A: Hello Charles, No, these 148gr. FMJ rounds are in the caliber of 7.62x54R which is different than 8mm Mauser. You will need 8mm Mauser ammo for your rifle if it is chambered in 8mm Mauser. A: These 7.62x54r surplus rifle rounds do contain corrosive components. If you are able to clean your rifle after each trip to the range and include cleaning the parts that may have been in contact with the powder or gases, corrosion should not be evident after use.